App Annie's Q1 report on the state of the app market reveals the same old thing. The Google Play Store had twice the number of apps downloaded as the App Store did, but the latter brought in 90% more money. Developers will make their apps more readily available to the platform that creates the most money for them. And once again, iOS apps are bringing in more money. Blame cheaper Android phones for this. The lowest priced current iPhone model, the Apple iPhone SE, is still at least three times the cost of the cheapest Android phones in Asia. For the first quarter of this year, revenue from iOS entertainment apps rose a healthy 230% year-over-year. 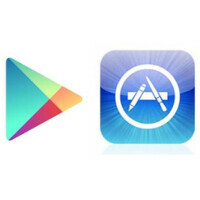 The annual gain for Google Play entertainment apps was 170%. Android did beat out iOS in the growth of revenue derived from streaming music. The Google Play Store had year-over-year top line growth in that category of 180% compared to 160% for iOS. The top categories downloaded from the Google Play Store in Q1 (games excluded) were tools, communication and photography. Based on revenue, the top three for the Google Play Store were communication, social and entertainment. For iOS, the top Q1 downloads were photo and video, entertainment, and social networking. Based on revenue, the top three categories for iOS in Q1 were Social Networking, Music, and Entertainment. App revenue came mostly from in-app purchases, but also included paid apps as well. Check out some graphs that tell you more about the first quarter, by clicking on the slideshow below. Because Android users spend less and get alot more in compared to iOS users. Question is, does this take into account advertising revenue? Because if it doesn't then the disparity could be huge since a free app doesn't have to mean no revenue. I was thinking the same thing. They dont even mention ad revenue. Im thinking this article is a wash or the people thay piled up statistics. This is just common sense. In general people who have more money to spend, spend more money. People who can afford a $650 smartphone also have more money to spend on apps and games than smartphone users who can only afford a $200 smartphone. And no matter what Android users wanna believe, the only reason Android has more users than iOS is because the majority of Android users have budget phones. If you only count flagship devices ($500 and up off contract) Android is far behind iOS in sales and this is why there is such a difference in revenue between iOS and Android. And the reason the number has went up and not decreased is more is because there are far more flagship Android users (the ones who actually spend money on apps/games) are leaving Android for iOS than iOS users leaving for Android. At this pace iOS will make up 80-85% of revenue by end of 2017. But on the bright side for Android users is Android will continue pulling away from iOS in total percent of users and will keep increasing the download total. Thanks to more and more budget Android users. Where is the evidence that says Apple sells more iPhones over $500 than Android? Is that even a valid comparison, why not compare phones of a certain standard, there are many Android phones below your benchmark figure, with specs that match or beat an iPhones. If you take smartphones Samsung alone sells more than Apple. If you are looking at money generated by Apps you need to include advertising revenue, I suspect the picture would be very different if using all means of revenue from apps and of course much more meaningful. IPhone revenue is rarely broken down into which handset was sold at which price point. Basically, there are two numbers posted. Apple will tell everyone their lump sum gross revenue off of shipments. And analysts will estimate the numbers of handsets sold. Since the article only mentions paid apps and in-app purchases, I'd doubt that any ad revenue was taken into consideration. Since it does only mention the App Store VS Play Store, it also doesn't seem to take into consideration that Android apps may generate revenue through 3rd parties which will not be evident in the Google Play Store. Unless if you have been a basement dweller for the past 8 years, you'd realise that the evidence that Apple selling more flagship phones than Android is in public view. A fair chunk of those people have iPhone 6S and 6S Plus compared to the S6 and S6 edge. Haven't really seen too many people with low end android phones through, it's always either a flagship or a old flagship here and I am assuming that most of the lower end phones are sold in developing markets with large populations which is why we don't see people owning them here. Open platform does has its shortcomings in term of Piracy. Every one in the Android ecosystem knows that. That's the reason why Android apps price are cheaper than iOS counterpart. But iOS do gets a lot of apps exclusivity. Yeah! To heck with the time and effort a developer puts into their apps! You deserve it for free because you're special! Apps are cheaper on Android because there is huge competition in the play store, with so many apps offering the same functionality. The Windows phone store makes even more money than the iOS App store, because there is even less competion between apps. My point is merely referring to the schmuck above that is advocating pirating Android apps. Well it is true. No one makes money if users are pirating your stuff. Wait how is this any relevant to the article or any comments? It's relevant. Z's comment is about Apple's policy. Go have a look at Apple's App Store policy and understand why the App Store makes such amount of cash. What about Developers? They work hard only to find their apps can be easily cracked? I hate that. How does it mean playstore have better selection of free apps? Play store volume is due to android's huge useage from hugh underdeveloped populous regions like india and africa. Due to the cost of Apple products, many apple users have the type of many to waste on buying apps. Such innovative title:http://www.androidauthority.com/app-annie-q1-2016-report-google-play-apple-app-store-687632/ Where would the tech be without you, Alan B.